I have to admit that, even as a horror film fan, outside of Dracula, I am mostly ignorant of the film work of legendary actor, Bela Lugosi. I also love old horror films so I was looking forward to watching a film that is considered to be one of the very first movies about zombies. With great expectations, I sat on my couch with popcorn and soda in hand and pressed play on my DVD player only to be sadly disappointed with the film on some levels and liking it on others. 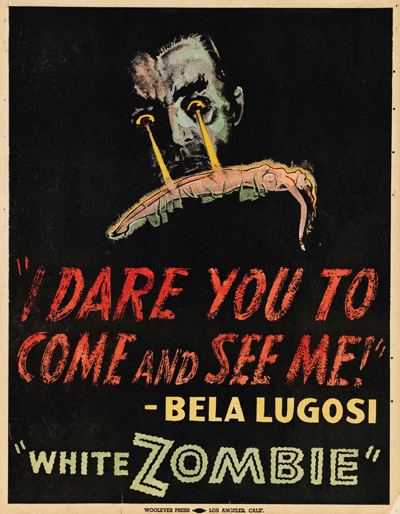 White Zombie was made in 1932 by Halperin Pictures (now owned by United Artists) and stars Bela Lugosi (Dracula) as a Murder Legendre, an evil voodoo master (is there ever a good voodoo master?) living in Haiti who runs a small army of zombies who do his bidding. A young American couple, Madeleine and Neil Parker, (played by Madge Bellamy and John Harron) arrive in Haiti by invitation of a young French plantation owner named Beaumont. Beaumont is infatuated with Madeleine and asks Murder to change her into a zombie so she will stay with him forever. Murder complies with Beaumont’s wishes and after faking her death drugs her so that she becomes a zombie. Meanwhile, Neil, distraught over his beloved’s death, visits Dr. Bruner (Joseph Cawthorn), a local Christian missionary who is also an expert in the study of voodoo and zombies (I didn’t know you could get a degree in zombie studies?). Dr. Bruner comforts Neil and tells him that Madeleine is not dead at all but is a slave of Murder Legendre. Back at the plantation, Beaumont is not pleased with Madeleine’s conversion to one of the walking dead for it appears that “there is no life in her” and he asks Murder to change her back to her previous self. Murder initially agrees and while drinking a toast to the return of Madeleine’s formerly lively self, he drugs Beaumont. Realizing he has been tricked, Beaumont staggers while Murder tells him that he has had eyes on his plantation and that Beaumont will make an excellent addition to his zombie army. Dr. Bruner and Neil arrive to save Madeleine. Murder commands Madeleine to kill Neil but her love for him is stronger than Legendre’s zombie potion and she drops a knife meant to kill Neil. There is a brief struggle and chase between Dr. Bruner, Neil and Murder, however, it looks as if Murder will get away but not before Dr. Bruner knocks out Murder which breaks his hold over his zombies. Without direction, the zombies wander aimlessly and fall off of a cliff and into the sea. Murder awakens and escapes Dr. Bruner and Neil only to be confronted by Beaumont who also pushes Murder off of the cliff and into the ocean with the rest of his zombies. The quality of the film I watched was bad and some of the acting by the supporting cast was overdone, overblown and overplayed. Lugosi actually did a fine job with his character despite the crazy sets and some poor lighting. The best actor in the movie, however, was not Lugosi but African-American actor, Clarence Muse, who did an uncredited role as the carriage driver. He has he best one-liners in the whole film “No. Not men. Zombies” and “They are not men, madame, they are dead bodies”. I’m not saying it is a bad film for it is not. There are some interesting lines in the film which openly explore some of the prejudices of White America during the 30s. For instance, when Neil is talking to Dr. Bruner about leaving Madeleine’s body behind in Haiti, Neil is shocked that she might be alive and alone with the local natives. Neil exclaims that he would rather see Madeleine dead than left in the clutches of dark natives. 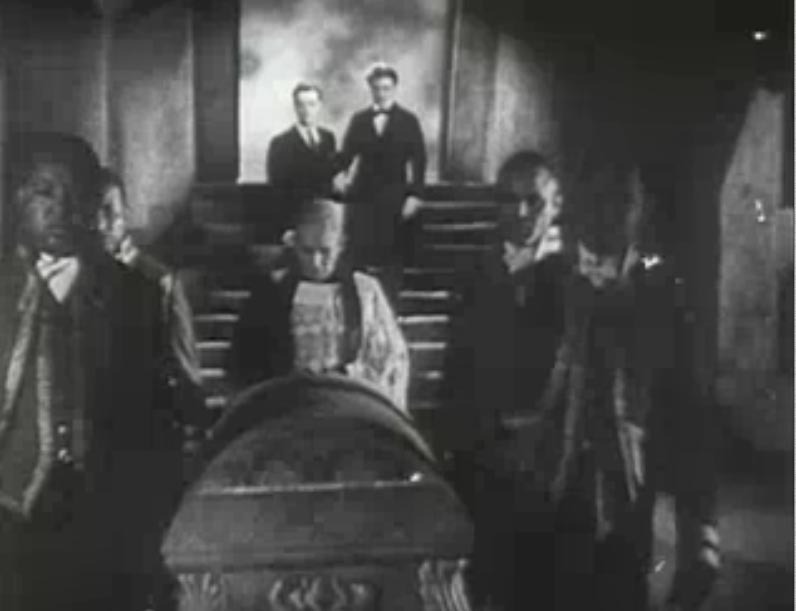 The zombies themselves barely make an appearance in the film and the makeup was so-so (although, in its defense, this was the 1930s). On the other hand, there were some pretty good zombies in the film. (see below). 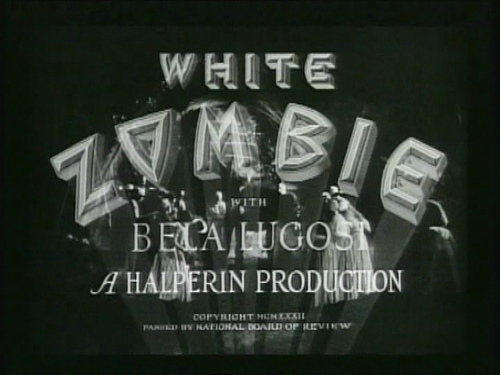 If you are interested in film history, then White Zombie is right up your alley. If you are looking for scares, then you might want to avoid this film and watch Night of the Living Dead instead. This entry was posted on December 22, 2011 at 4:29 pm and is filed under horror films, Mystery with tags bela, lugosi, white zombie, zombies. You can follow any responses to this entry through the RSS 2.0 feed. You can leave a response, or trackback from your own site.